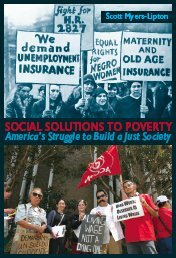 "Scott J. Myers-Lipton has compiled an impressive array of articles on the social context of poverty in the United States and on the various plans and proposals to alleviate human suffering. His unique volume could become a standard reference not only for scholars who study poverty, but also for policymakers and citizens seeking realistic solutions." At a time in which scholarly policy work often has become divorced from the acute reality of pain and suffering, Myers-Lipton has delivered up a treatise that harkens back to Michael Harrington's moving wake-up call, "The Other America." • from William Julius Wilson’s universal program of reform to George Bush’s armies of compassion.